Anambitious experiment to search for antimatter galaxies and elusive darkmatter hastaken a step closer to its planned launch on NASA's last scheduledspaceshuttle flight next year. The experiment,called the AlphaMagnetic Spectrometer, was expected to arrive at NASA'sKennedy SpaceCenter in Florida today to be prepped for its journey to theInternationalSpace Station aboard NASA's finalplanned shuttle flight. Liftoff is currently slated for Feb.26, 2011. NASAspokesperson Allard Beutel told SPACE.com the huge experiment wouldarrive atthe Florida space center around 11:30 a.m. EDT (1530 GMT). The AMS, a15,000-pound (6,800-kg) cosmic-ray detector, was loaded onto a U.S. AirForceGalaxy transport aircraft in Geneva on Wednesday. The AMS experimenthas areported cost of nearly $2 billion, according to press reports. The detectorhad been undergoing some final modifications at the particle-physicslaboratoryCERN, along the Swiss-French border. 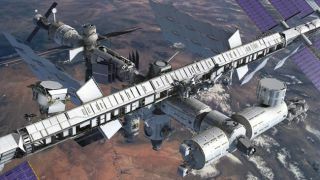 Projectscientists have spent the last few months replacing the spectrometer'svital superconductingmagnet with a long-lasting one that will give the experimenta longer lifeon the space station. "Theentire AMS collaboration is delighted by this departure, because itmarks acrucial milestone for the experiment. We are getting close to the spaceshuttlelaunch and the moment when our detector will finally be installed onboard theISS," said the project's leader Samuel Ting, a Nobel laureate physicistwithMIT, in a statement. "The detector’s construction phase is now finishedand we are eager for the data collection phase to begin." More than600 physicists from 16 countries and nearly 60 institutes are involvedin theexperiment, which is a collaboration of NASA and the U.S. Department ofEnergy,among others. Ting andhis colleagues decided on the magnet swap earlier this year after theInternational Space Station received a life extension through at least2020. Thespectrometer's original magnet was designed to rely on a supply ofcryogenicliquid helium to stay cool, which would eventually run out. The newmagnet isdesigned to be permanent. NASAoriginally canceled the shuttle mission to deliver the AMS to the spacestationfollowing the 2003 Columbia shuttle disaster. But Congress laterapprovedfunding for the flight. Antimatteris like a mirror image of regular matter; each "normal" particle isthought to have an antimatter counterpart. Positrons, for example, aretheantimatter versions of electrons; when the two come together, theyimmediatelyannihilate each other. Whilescientists know antimatter exists, they have yet to directly observedarkmatter, but have long inferred its existence because of itsgravitational pull onthe universe. AMS hasthe potential to help scientists confirm the existenceof dark matter, and perhaps to help find entire galaxies madeof antimatterusing its cosmic ray detector. Cosmicrays consist of high-energy particles that emerge from catastrophicevents suchas supernovas. The particles are typically absorbed by Earth'satmosphere, so aspace-based detector has a better chance of spotting them, researchershavesaid. AMS willanalyze these cosmic rays to determine if they're normal matter such asprotonsand electrons, or something more exotic. The detection ofanti-electrons couldsignal the existence of dark matter, researchers said. AMS'mission is similar to that of the cosmic-ray detector PAMELA, anItaliansatellite launched in 2006 that may have detected dark matter'ssignature. But thedetector on AMS will be even more sensitive, project scientists said. "Thelaunch of AMS detector is very timely," project member RobertoPetronzio,president of the Italian National Institute for Nuclear Physics, saidin a statement. "Today we are well aware of our ignorance of the universe’s mostabundantconstituents and we still challenge the puzzle of matter-antimatterasymmetry.Furthermore, recent results from the Pamela experiment suggestscenarios forimportant discoveries for AMS."